We’re kicking off the home stretch of the season with a package of jelly beans that I’ve been looking forward to reviewing for years: Trader Joe’s Gourmet Jelly Beans. Trader Joe’s is one of my favorite stores at which to shop for snack food, including their wide array of quality candies. I have had these jelly beans before, so I know they’re good; the question now before us is: How good? Memory is a funny thing. My memory of Trader Joe’s beans is that they were very similar to Jelly Belly so similar that I wondered if they were actually produced by Jelly Belly and simply white-labeled by Trader Joe’s. Several years later, with the experience of three-and-a-half dozen jelly bean reviews behind me, it is now clear that that is not the case. Trader Joe’s beans have a very similar average size as Jelly Belly beans (maybe slightly larger), but they are less pristinely shaped. Most beans are triangular prisms with rounded edges, with a gentle rounded dimple kissed into one side. They are very consistent in size and shape. One of the better efforts in this category in quite a while! I think the chewability of these jelly beans is perfect. The body is substantial and the chew lasts long enough to really taste the flavor of a bean, but not so long as to feel like a chore. They stand out from Jelly Belly in this category. 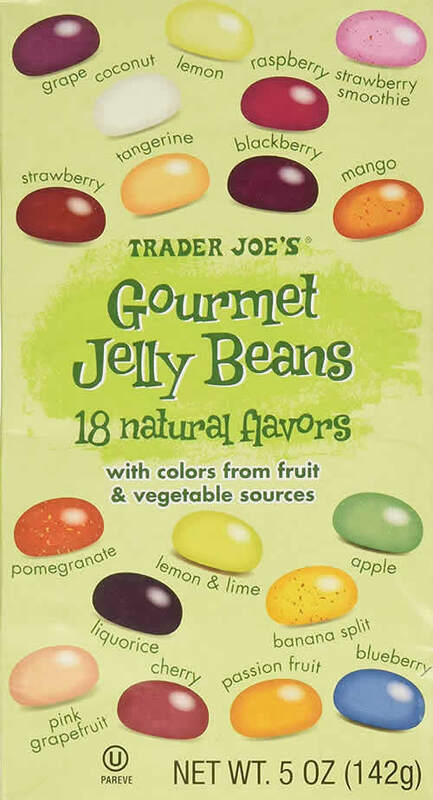 Trader Joe’s Gourmet Jelly Beans have a good texture that is very reminiscent of the Jelly Belly texture. The one knock on it is that, like Jelly Belly, the shell is very thin. It sometimes breaks up into nice little hunks, but more often dissolves into a fine crystalline form. That’s not a bad thing, necessarily. As for the insides, they are pleasantly smooth. At 18 flavors, this package is second only to Gimbal’s Gourmet Jelly Beans in the number of flavors it contains. This is quite a nice assortment, without being as overwhelming as the Gimbal’s offering. I was a bit disappointed to only get one Lemon bean, and some of the other colors took very careful observation under perfect lighting circumstances to distinguish, but I’ve seen worse situations in both of those areas. Grape tastes very much like classic grape juice. Strawberry Smoothie is delightful. There is a distinct creaminess that separates it from the basic Strawberry flavor, which is great in its own right. The citrus flavors are all distinctive enough to stand apart from each other. Even the Lemon & Lime, which reminds me of the flavor of Sprite, is clearly different from Lemon. The more uncommon flavors, like Mango, Pomegranate, and Passion Fruit, all do a great job representing their real life fruit. Apple is one of the most faithful Granny Smith flavors I’ve ever encountered. This Licorice bean is a little spicier than most I’ve had. I get a note of cinnamon in it. Banana Split does a nice job of tasting like more than just banana. There is a sweetness to it that actually hints at the other flavors in the classic ice cream sundae. Cherry tends to be one of my favorite flavors, but this one is a bit disappointing. It can’t hold a candle to Jelly Belly’s Very Cherry. In sum, this is an outstanding collection of flavors. As with the Gimbal’s bag, it would be totally impractical to try and eat one of each of these flavors here, even if removing Coconut and Licorice. I will do what I did in that Gimbal’s review and select the six most common flavors I’ve come across in my reviews and eat all of those at once. I would have included Lemon instead of Lemon & Lime, but unfortunately I can’t do that, because I already ate the one Lemon bean that was in this box. The ease of chewability and perfect size of the Trader Joe’s beans made chewing them a very reasonable task. The texture remained strong, too, avoiding the Skittles problem. As for the taste, something very interesting happened with these six beans. As the flavors started to mingle, the overall flavor began to resemble something close to a classic fruit punch flavor. It was rather delightful! The flavors didn’t retain their individuality as well as some sets, but that’s a minor criticism. Trader Joe’s makes a very strong showing in this category. I’m sure other combinations of their beans would also work well together. We have a new king of the hill! Trader Joe’s Gourmet Jelly Beans is the first to break the 30 mark in total score, edging out the previous top score of 29 by SweeTarts Jelly Beans. I knew that I would review these beans well, but I didn’t quite expect that. What an exciting way to kick off the final week of the 2019 season!